Apples are a high-fiber fruit with insoluble cellulose and lignin in the peel and soluble pectins in the flesh. Their most important vitamin is vitamin C.
One fresh apple, 2.5 inches in diameter, has 2.4 g dietary fiber and 4.6 mg vitamin C (6 percent of the RDA for a woman, 5 percent of the RDA for a man). The sour taste of all immature apples (and some varieties, even when ripe) comes from malic acid. As an apple ripens, the amount of malic acid declines and the apple becomes sweeter. Apple seeds contain amygdalin, a naturally occurring cyanide/sugar compound that degrades into hydrogen cyanide. While accidentally swallowing an apple seed once in a while is not a serious hazard for an adult, cases of human poisoning after eating apple seeds have been reported, and swallowing only a few seeds may be lethal for a child. Fresh and unpared, to take advantage of the fiber in the peel and preserve the vitamin C, which is destroyed by the heat of cooking. Look for: Apples that are firm and brightly colored: shiny red Macintosh, Rome, and red Delicious; clear green Granny Smith; golden yellow Delicious. Avoid: Bruised apples. 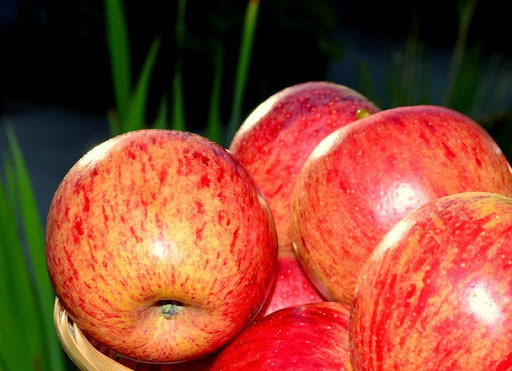 When an apple is damaged the injured cells release polyphenoloxidase, an enzyme that hastens the oxidation of phenols in the apple, producing brownish pigments that darken the fruit. It's easy to check loose apples; if you buy them packed in a plastic bag, turn the bag upside down and examine the fruit. Store apples in the refrigerator. Cool storage keeps them from losing the natural moisture that makes them crisp. It also keeps them from turning brown inside, near the core, a phenomenon that occurs when apples are stored at warm temperatures. Apples can be stored in a cool, dark cabinet with plenty of circulating air. Check the apples from time to time. They store well, but the longer the storage, the greater the natural loss of moisture and the more likely the chance that even the crispest apple will begin to taste mealy. Don't peel or slice an apple until you are ready to use it. When you cut into the apple, you tear its cells, releasing polyphenoloxidase, an enzyme that darkens the fruit. Acid inactivates polyphenoloxidase, so you can slow the browning (but not stop it completely) by dipping raw sliced and/or peeled apples into a solution of lemon juice and water or vinegar and water or by mixing them with citrus fruits in a fruit salad. Polyphenoloxidase also works more slowly in the cold, but storing peeled apples in the refrigerator is much less effective than immersing them in an acid bath. When you cook an unpeeled apple, insoluble cellulose and lignin will hold the peel intact through all normal cooking. The flesh of the apple, though, will fall apart as the pectin in its cell walls dissolves and the water inside its cells swells, rupturing the cell walls and turning the apples into applesauce. Commercial bakers keep the apples in their apple pies firm by treating them with calcium; home bakers have to rely on careful timing. To prevent baked apples from melting into mush, core the apple and fill the center with sugar or raisins to absorb the moisture released as the apple cooks. Cutting away a circle of peel at the top will allow the fruit to swell without splitting the skin. Red apple skins are colored with red anthocyanin pigments. When an apple is cooked, the anthocyanins combine with sugars to form irreversible brownish compounds. Juice. Apple juice comes in two versions: "cloudy" (unfiltered) and "clear" (filtered). Cloudy apple juice is made simply by chopping or shredding apples and then pressing out and straining the juice. Clear apple juice is cloudy juice filtered to remove solid particles and then treated with enzymes to eliminate starches and the soluble fiber pectin. Since 2000, following several deaths attributed to unpasteurized apple juice contaminated with E. coli O157: H7, the FDA has required that all juices sold in the United States be pasteurized to inactivate harmful organisms such as bacteria and mold. Note: "Hard cider" is a mildly alcoholic beverage created when natural enzyme action converts the sugars in apple juice to alcohol; "nonalcohol cider" is another name for plain apple juice. Drying. To keep apple slices from turning brown as they dry, apples may be treated with sulfur compounds that may cause serious allergic reactions in people allergic to sulfites. As an antidiarrheal. The pectin in apple is a natural antidiarrheal that helps solidify stool. Shaved raw apple is sometimes used as a folk remedy for diarrhea, and purified pectin is an ingredient in many over-the-counter antidiarrheals. Lower cholesterol levels. Soluble fiber (pectin) may interfere with the absorption of dietary fats, including cholesterol. The exact mechanism by which this occurs is still unknown, but one theory is that the pectins in the apple may form a gel in your stomach that sops up fats and cholesterol, carrying them out of your body as waste. Potential anticarcinogenic effects. A report in the April 2008 issue of the journal Nutrition from a team of researchers at the University of Kaiserslautern, in Germany, suggests that several natural chemicals in apples, including butyrate (produced naturally when the pectin in apples and apple juice is metabolized) reduce the risk of cancer of the colon by nourishing and protecting the mucosa (lining) of the colon. Intestinal gas. For some children, drinking excess amounts of apple juice produces intestinal discomfort (gas or diarrhea) when bacteria living naturally in the stomach ferment the sugars in the juice. To reduce this problem, the American Academy of Pediatrics recommends that children ages one to six consume no more than four to six ounces of fruit juice a day; for children ages seven to 18, the recommended serving is eight to 12 ounces a day. Cyanide poisoning. See About the nutrients in this food. Sulfite allergies (dried apples). See How other kinds of processing affect this food.